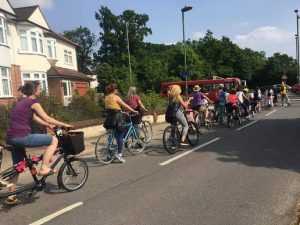 Our September ride will go from Oakwood tube station to Trent Park in Cockfosters – there will also be a feeder ride from Green Lanes in Winchmore Hill. It will be maximum 1 hour for the round from/to Oakwood tube station, plus a good break at the cafe in Trent Park. The feeder ride from Green Lanes will be around 1 hour each way on a slightly hilly, mostly traffic-free route. Are you a bit new to cycling, coming back to it after a long time, or want to ride with your kids? Then Easy Riders is for you! Run by experienced volunteers at Enfield Cycling Campaign, they are led, marshalled rides at a gentle pace using the new cycle infrastructure, green spaces and quiet roads, with a decent café stop halfway through. We’re holding them on the last Saturday of every month, April – September. For Oakwood tube station, meet outside the station under the giant tube sign. This entry was posted in Easy Riders on September 19, 2018 by Oliver Bruckauf.